But amidst the Hurricane Irma horror stories flooding the media, the story of Kate Jackson and her fiancé, Alex Ashman, is a refreshing ray of God's light in the storm. 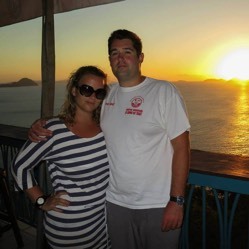 Irma left the residents of the British Virgin Islands fearing for their lives like never before, but for Kate and Alex, their panic was three-fold with 6-month-old triplets in their care. 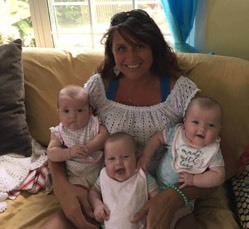 Preparing for the worst, the couple sought shelter with their baby girls, Beatrice, Isabella and Charlotte in Kate's mom's house on the island of Tortola. Though the biggest of the British Virgin Islands, Tortola was still no match for the raging power of Irma. The family was crammed into a small bathroom with relatives and friends when the roof ripped clean off the house. As the foundation crumbled around them and the bathroom walls began to cave, panic rose exponentially. "Our house was a gauntlet of destruction," said family friend Nick Cunha of the terrifying experience. "First a balcony went, then the kitchen. We ended up in the only remaining room, a recently constructed bathroom." The group cowered in the shower, hovering over the babies while the unforgiving storm destroyed everything around them. "The three women each held a baby," explained Nick. "Me and Alex were holding a bed headboard over us all." "At one point, we were saying goodbye to each other ... I went over to the door to see if there was a way out to get to a solid concrete generator room. As I twisted the handle it blew open in my face and I saw that there was no longer a house. It was a slow-motion moment. That was like staring at God." Every last one of them made it out alive, making the 6-month-old triplets some of the youngest survivors of Hurricane Irma. Praise God for keeping this couple and their precious babies safe amidst the deadly forces of mother nature. Friends are currently raising money to help the couple get back on their feet. If you are interested in donating to the victims of Hurricane Irma, please visit Charity Navigator for a list of highly-rated organizations responding in its aftermath.